It's Christmas time and Jet Set Sam is Back With Our World Famous Gift Baskets. The Jet Set Salmon Pack is the ultimate Gift Basket Including Fresh Smoked Salmon! What better way to wish someone than sending them a gift pack from Jet Set Sam. Our Jet Set Pack gives you an amazing variety of fish, chocolate and cheeses your family, friends and business associates are going to love! Did we mention these make a great gift for all occassions? Business Gift for Clients? 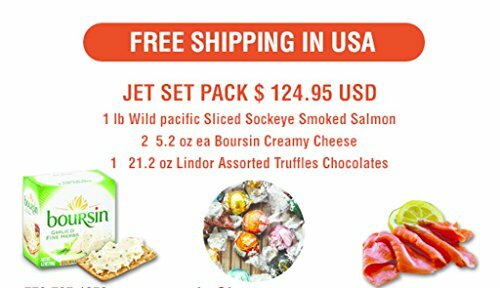 Smoked salmon is the feature product in this gift pack. It's wild smoked sockeye salmon fished off the coast of British Columbia Canada. This is a premium quality seafood product that goes well with cheese and crackers, an eggs benedict or made into a decadent sandwich. As if the salmon wasn't enough were also including a 2 pack of creamy smooth boursin garlic cheeses and big bag of Lindor Lindt Chocolate balls to satisfy the sweetest holiday tooth. Still Thinking About Whether to Buy The Jet Set Pack? Here's Whats Inside! FRESH WILD CAUGHT PRE SLICED SALMON - Our salmon is perfectly packaged and expertly sliced to provide you with the finest quality smoked salmon. Our cold smoked pre sliced salmon works perfectly as an appetizer with the some caviar and cream cheese or as the main attraction for your dinner party. If you have any questions about this product by Jet Set Sam, contact us by completing and submitting the form below. If you are looking for a specif part number, please include it with your message.